The chickens have grown quite quickly through the summer. One of our hens is definitely a rooster. Clyde von Zeppelin is an enthusiastic crower, and also loves the ladies. I find roosters highly entertaining, though, and actually really enjoy having him. Plus, there’s always a chance that one of the hens will go broody next spring and actually hatch some chicks, which is always a great time. 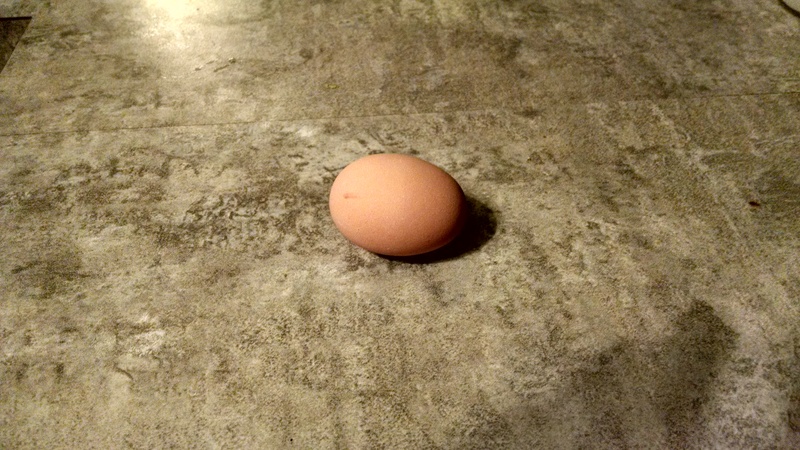 While I’m not 100% sure, I’m pretty sure that our first egg came from Charlotte, who has continued to lay every day since her first egg appeared. Someone else, probably Isabelle, is also laying an egg every day or two. Charlotte and Isabelle, along with Priscilla and Esther, will all lay light or medium-brown eggs. Penelope should lay very dark brown, Millicent’s should be white, and Henrietta’s will be either green or blue. Our first egg was laid September 16. When pullets first start to lay, their eggs are quite small, although they will eventually get bigger. I’ve legit taken pictures of eggs every day. 😀 This one is in the nest box, which the hens have definitely been using. Last Sunday we ate some of our eggs for the first time!! Eggs actually can last quite a long time before spoiling, and most store-bought eggs are around a month old. Eggs are comprised of yolk, inner white, and outer white. 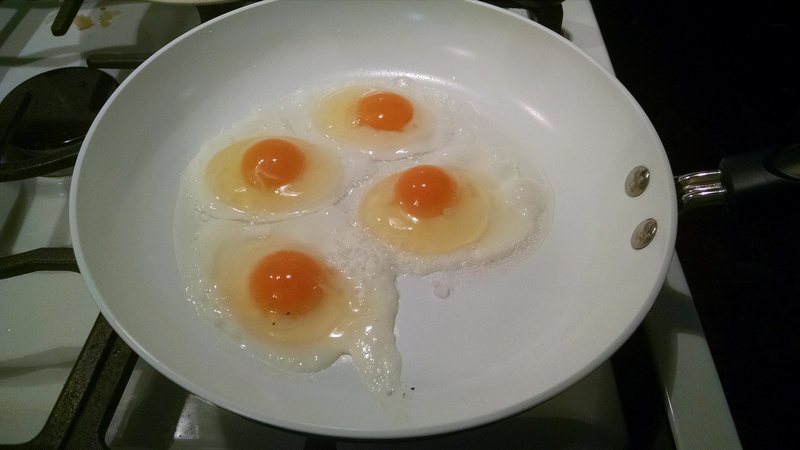 The fresher an egg is, the less air has entered the egg, which means that the yolk and inner white will stand taller, and the inner white will retain its egg shape, as you can see in this picture. Fresh eggs also tend to be brighter in color. We’re pretty excited about eggs coming, and will probably expand the flock next spring as well. I also just enjoy watching the chickens. They are also industrious, scratching around and getting into things. Ours are friendly and spoiled, expecting a treat every time someone walks past the fence. They love eating non-mean table scraps, and things like watermelon rinds and corn cobs are their favorite. 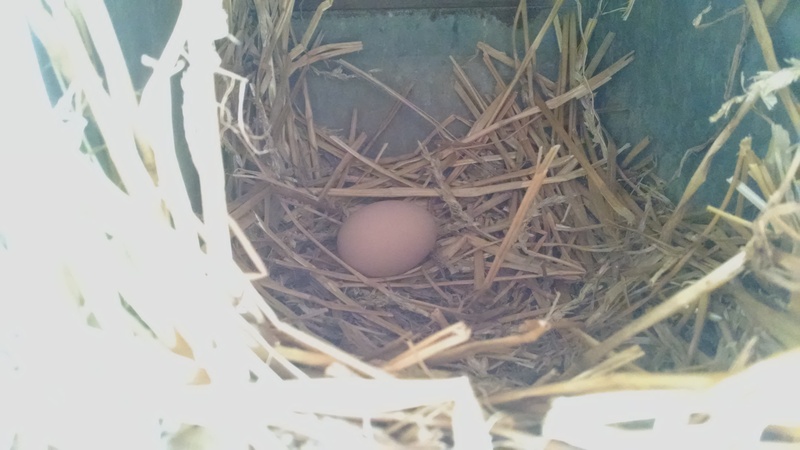 All in all, the chickens have been a successful project so far, and having them around makes me super happy, especially now that there are eggs! 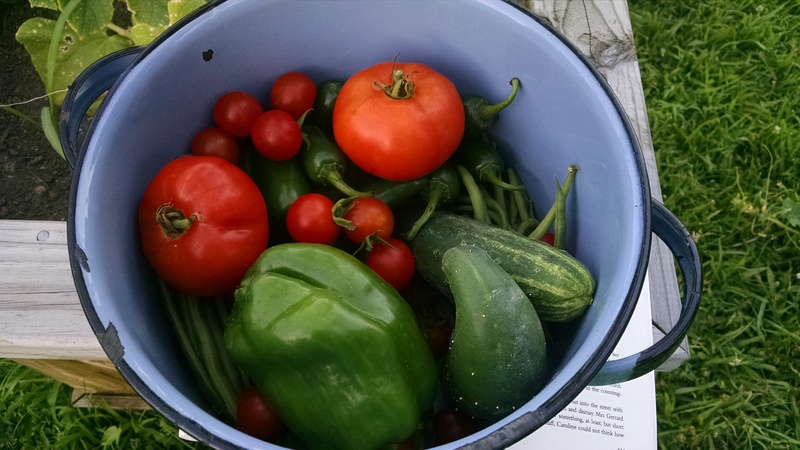 So the garden definitely spiraled way out of my control this summer. Part of the problem was that we went on vacation for ten days right in the middle of July, when things were really starting to happen. We had a super wet June, which meant everything grew like crazy, and then a super dry August, which meant I ought to be watering everything a lot (which I haven’t). We definitely had more tomatoes than I could have used in a year, along with some cucumbers, peppers, beans, and herbs. We already have a lot of plans for next year, hopefully compensating for some of this year’s mistakes. This was one day’s worth of harvest!! One of the biggest problems this year was simply me being unprepared to deal with lots of vegetables. I’m good at making salads, but had no idea what to do with all the extras. I’m already working on experimenting with a few different recipes to see if we can find something worth canning next year. I’ve never tried canning, but I have wanted to for years. Maybe next summer it will finally happen!! While my vegetable preservation skills need some improvement, I did much better with drying herbs. I’ve always loved herbs, and really want to continue growing, harvesting, and utilizing them. Herblore is fascinating, and I’ve only scraped the surface of what can be learned. Point is, I was able to actually dry some herbs! Since it is a first year for what I planted, I didn’t harvest a lot from the perennials, but I still quite pleased with the results. This was all done in mid-late July, so I should get a second harvest before frost from many of the plants. Before drying, I cut bunches from the herbs and removed any damaged leaves, and also checked for insects. In this picture, I have several bunches hanging to dry, mostly savory, parsley, lemon balm, and several varieties of basil (my favorite!!). Also, although there appears to be light pouring through that window, it actually faces north and is under a porch overhang, so no direct light actually comes through the window. 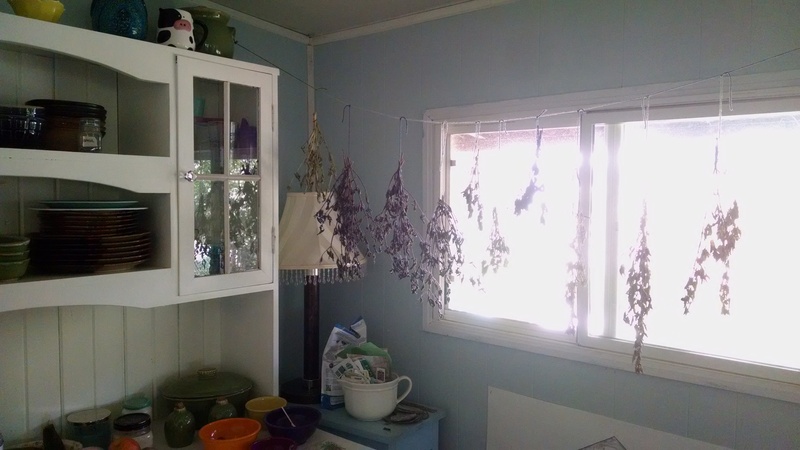 Herbs are best dried in a dark, dry area. 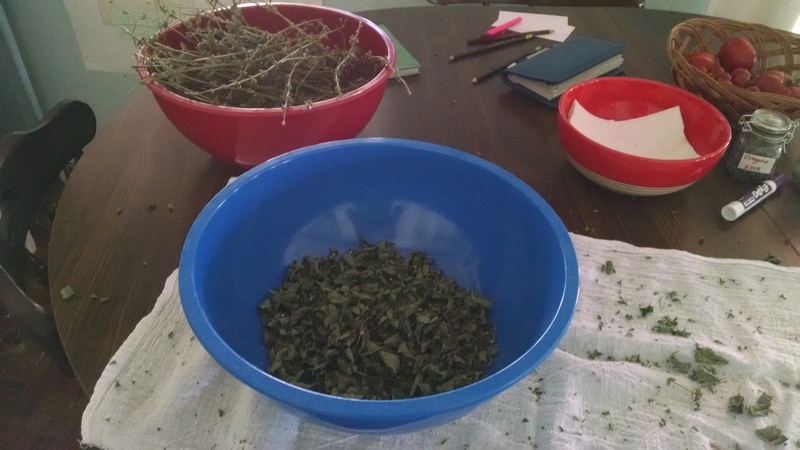 After the herbs dried thoroughly, I stripped the leaves from the stems. As you can see, I also made a mess. So much fun, though, and smelled SO GOOD. 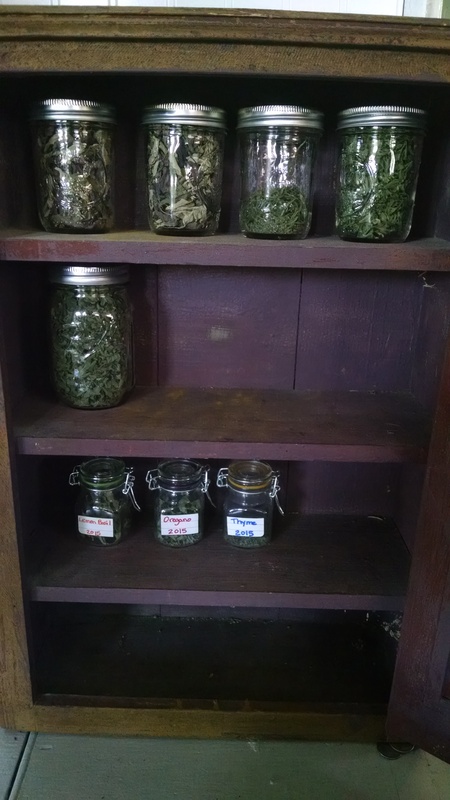 After stripping, I put the leaves into canning jars (although I didn’t seal them in any way), and then put the jars in my little herb cabinet. I’m super excited about having my own herbs through the winter. I love using herbs in cooking, and am also trying to make my own herbal teas. 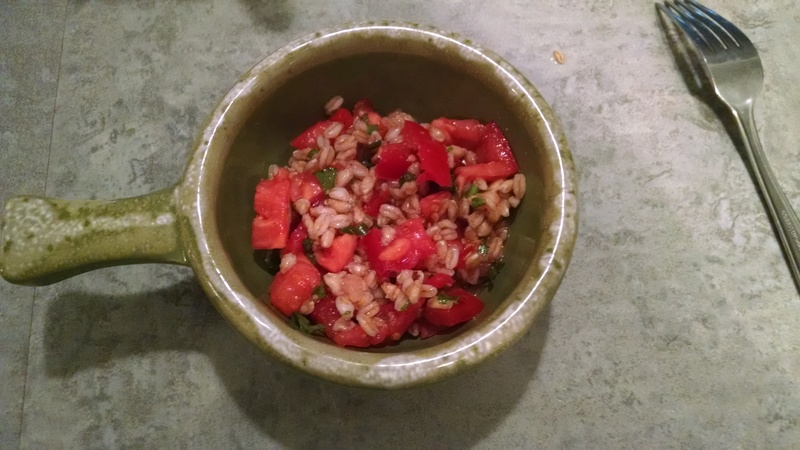 One of my big challenges for the summer is trying to learn how to cook with what I have fresh, and also trying to incorporate more beans, rice, and grain into our diet. Here, I made a sort of no-lettuce salad – this recipe was quinoa, tomatoes, herbs, and a vinaigrette dressing, and actually ended up being quite delicious. The quinoa has a very pleasant, nutty taste that really complemented the fresh tomatoes. Although not strictly “harvest” related, I thought I would also update you on the little fish pond. 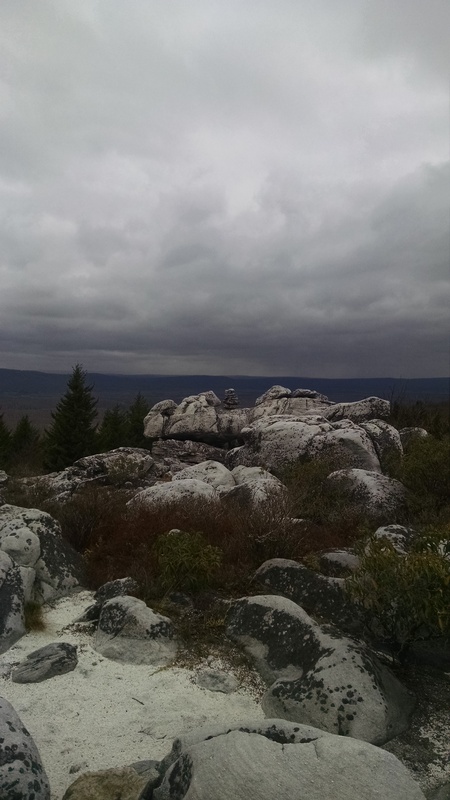 As you can see, it’s really settled into the landscape!!! 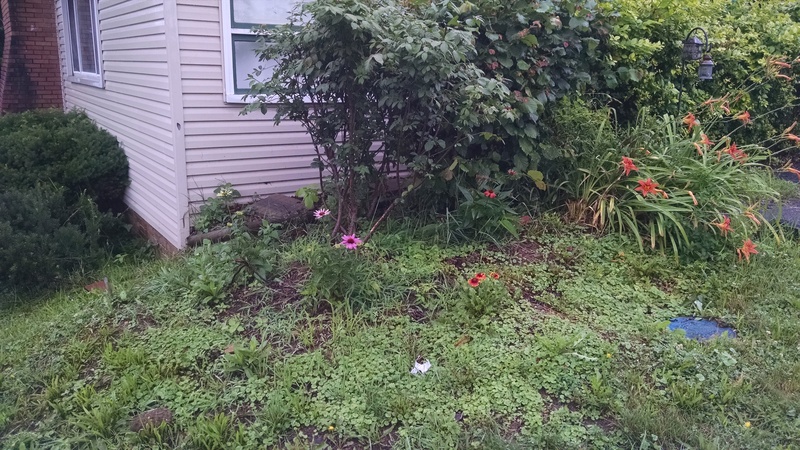 We still have so much we want to do in this side garden, including moving and redoing the fence, and continuing to expand the herbs, but for a first summer, it really doesn’t look too bad. 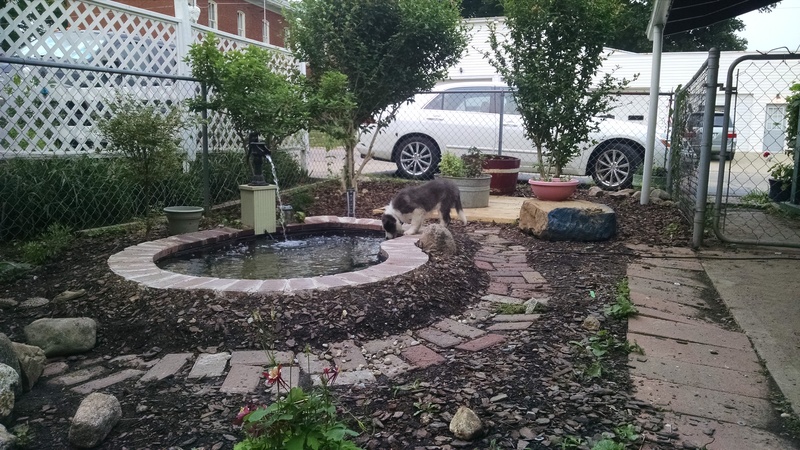 We bough some plants and four fish for the pond, and everything has thrived. We’ve even had frogs living there, voluntarily! Here are a few of the fish, who, by the way, have produced babies!? That was unexpected, but we definitely have a few little fish swooping around, hiding in the rocks, and trying to avoid being eaten by their parents. Who knows if they’ll survive, but it’s sort of fun to see them growing! So, that’s a little update on the gardening aspect of the homestead. 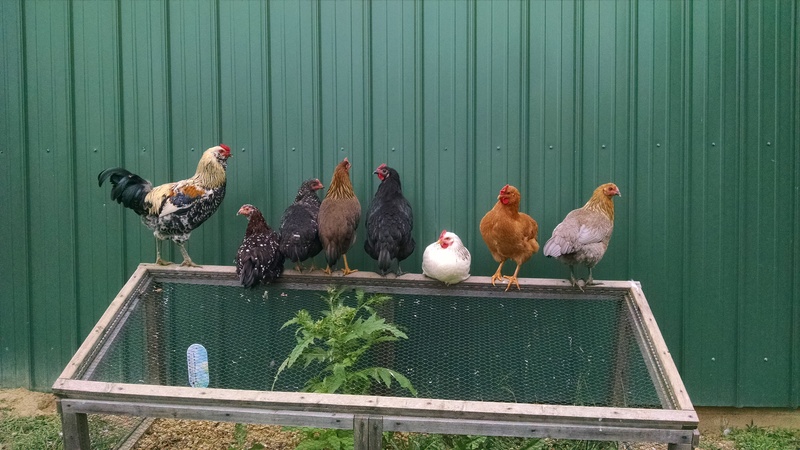 Coming tomorrow – more about chickens!! So there is this awesome thing about my life: Tom literally makes my dreams come true. 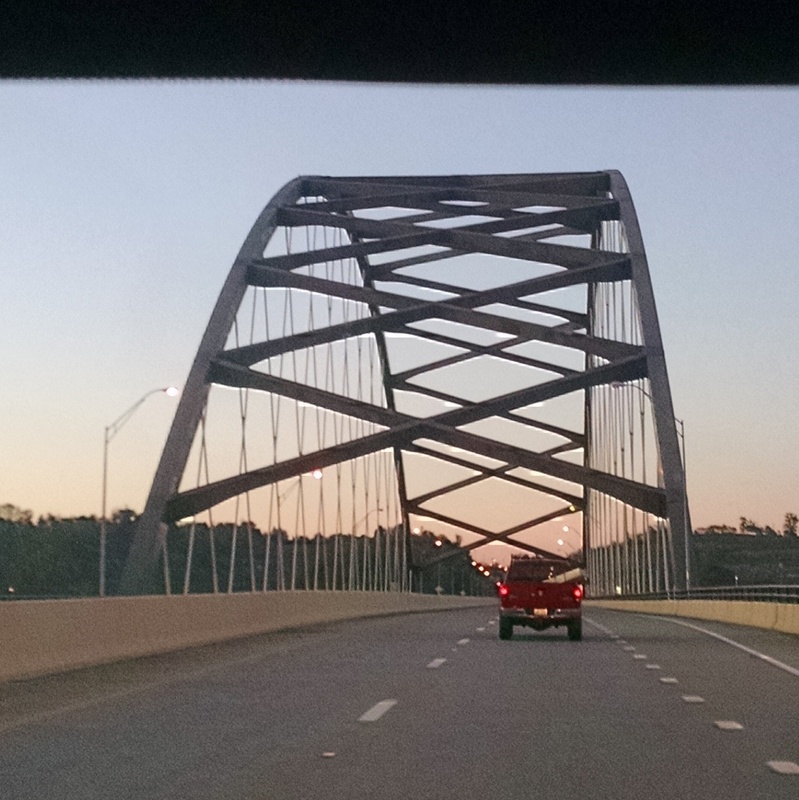 Like I think of a thing that I’ve always wanted, and then he builds it. It like a miracle and I can’t get over it. 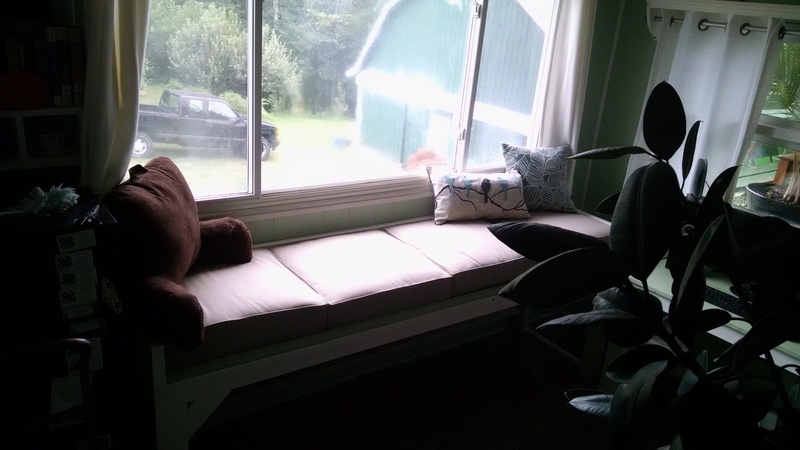 In this edition of Tom making a dream come true, he built me a window seat. I’ve always wanted one. They look so cozy and happy, the perfect place to read a book. I mentioned it offhandedly one day, about wanting one, and his response was, “Well, I could build that.” Of course he could! 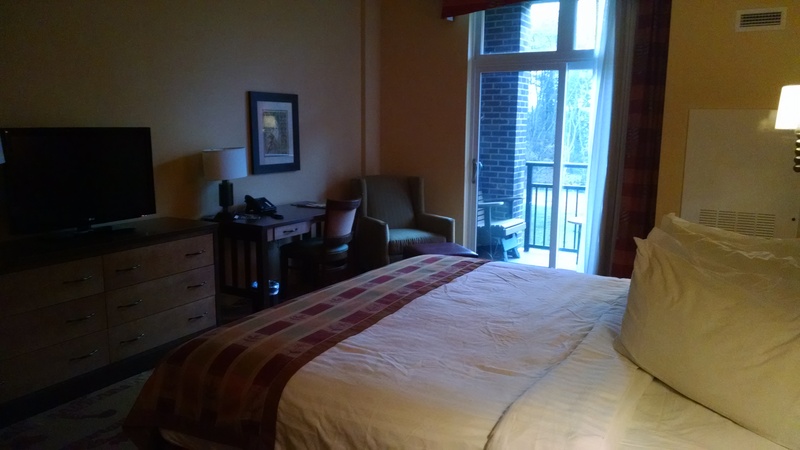 We decided to use one of the big picture windows in the lower room as the location for our window seat. These picture windows (there are two) face full south and are quite long. We also needed additional storage in this room, so Tom designed the window seat to have shelves underneath as well. For him, it was a spare-time project that he puttered on as he had time, so it took much of the summer to get it together, especially as he was building a desk at the same time. Eventually, a corner shelf will connect the two pieces of furniture. 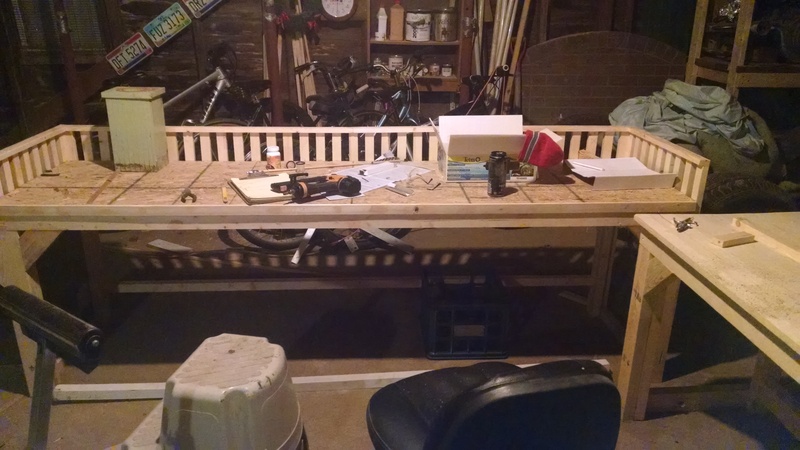 Here we have the window seat in its rough, beginning stages down in the garage. True to form, almost the entire thing is built from 2x4s, including the little railing Tom built around the edges to hold the cushions in place. The bottom of the seat part is plywood. To the right is the desk. This is also built mostly from 2×4’s, with the exception of the top, which is an actual nice piece of wood – poplar, I believe. 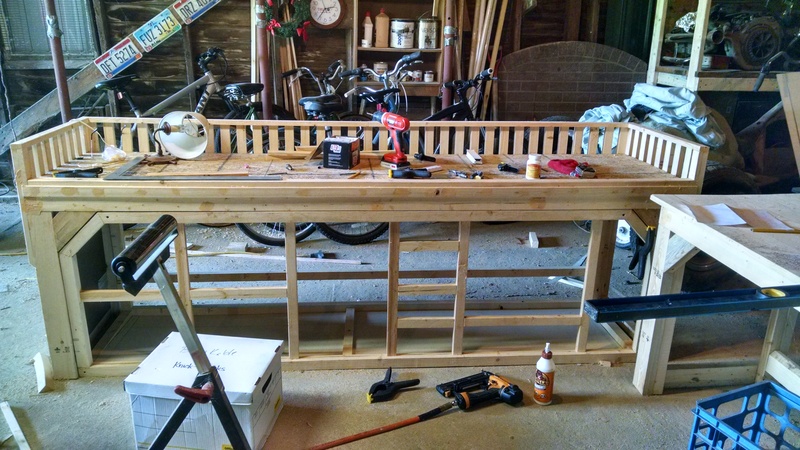 After putting together the main frame, Tom began working on the shelves that would go underneath. 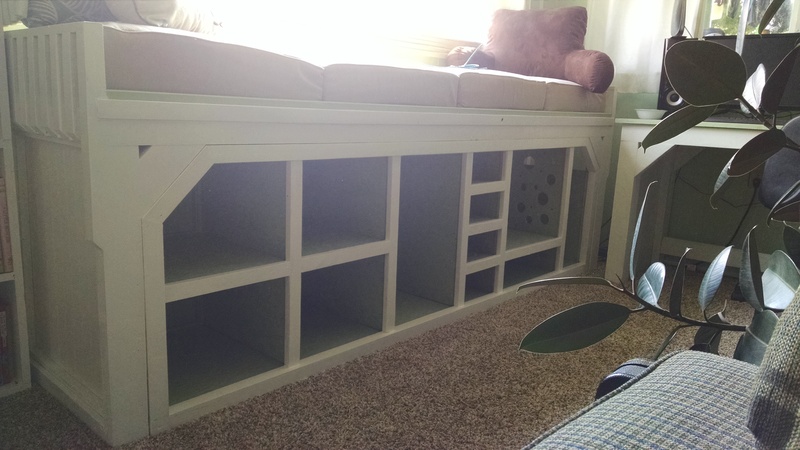 To make the furniture easier to move (and not quite as heavy), he built the shelf as as separate piece that slides underneath the window seat. In this picture, you can see the beginning of the framework for the shelves. We knew we needed a space for the desktop computer tower, the printer, paper, and banker boxes. 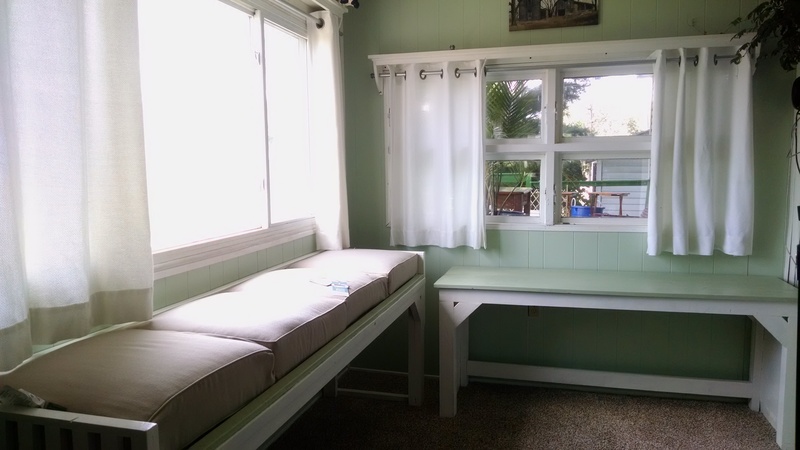 While he was finishing up the shelves, Tom went ahead and painted the actual window seat and the desk and moved them up to their new home in the lower room. We used the same white on the rest of the trim. The desktop is supposed to be darker than the walls (it’s the next darker color on the paint card), but really looks almost the exact same shade. In the meantime, I was in charge of locating cushions, tricky because we needed about 9′ of cushion. 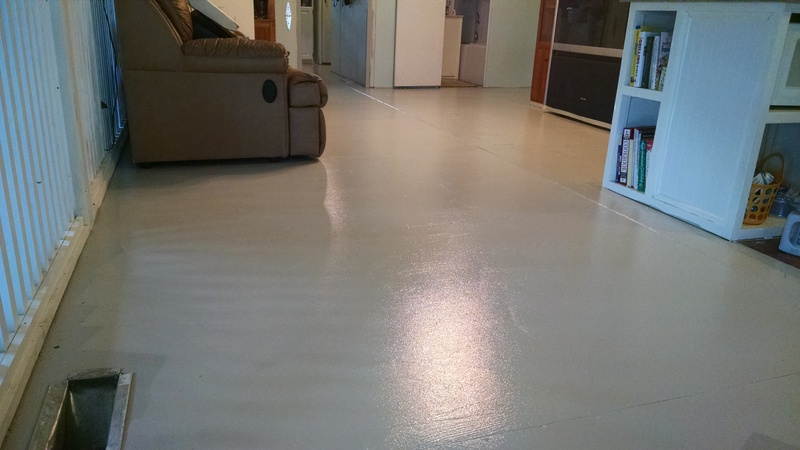 We talked about ordering a custom length of foam and then covering it ourselves, but it was just so cost prohibitive. We wanted something at least 4-6″ thick (what’s the point of a window seat that isn’t super comfy? ), and we obviously needed a matching color. In the end, I found these cushions on sale at Target. They’re actually indoor-outdoor furniture cushions, and they fit perfectly in the space. They’re soft and cozy, and a neutral beige. With some cheery throw-pillows, they work great. You can see that the window seat is on the tall side, but I absolutely love it. Here it is with the shelves inserted. Although it is hard to tell from the picture, because I am terrible at dealing with lighting issues, the insides of the shelves are painted green to match the desktop. The holes drilled in the side of the shelf on the right are to ventilate the computer tower. Here we have the mostly-finished product! You can see the printer with the custom-sized shelves next to it that are perfect for paper. 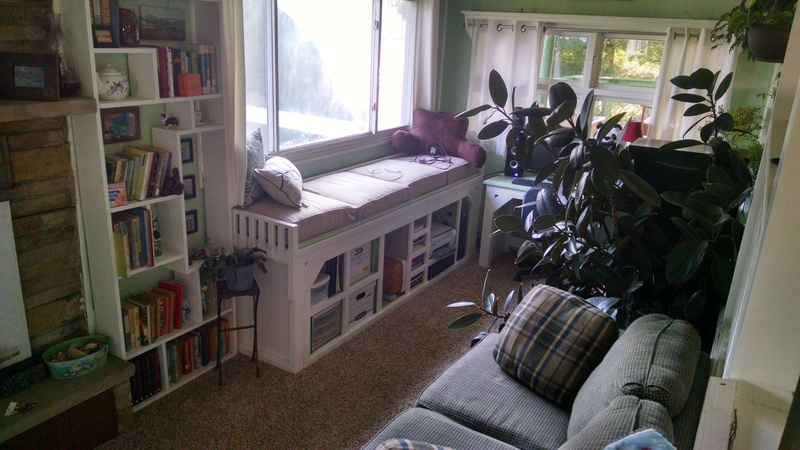 Since Tom built them, the shelves are super sturdy, and can be used as steps to get into the window seat if necessary. So, end result? I get another dream fulfilled – the window seat is fabulous, and has become one of my favorite spots to curl up with a book. Total win. So, after this marathon of posting, you all are just about caught up. One last post to wrap up some odds and ends, and you’ll have a pretty solid picture of what’s been happening around here for the last couple of months. Little baby peaches back in May!! Back in April, I mentioned that we started to plant some fruit trees. What with so much rain lately, they have really been flourishing, although I apparently haven’t taken a picture of the orchard as a whole. We ended up with two pear trees, three peach trees, two plum trees, and five apple trees. We have some peaches and a couple of plums growing, as well as just a couple of apples. 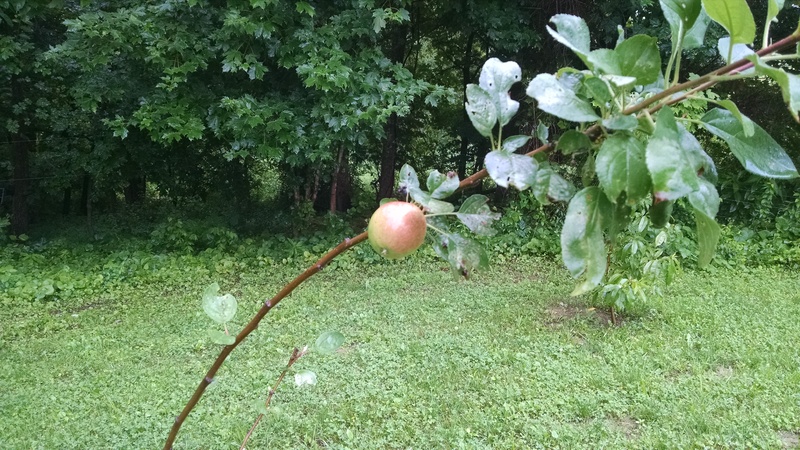 It’s a Wolf Creek apple tree… anyone else ever heard of it?? 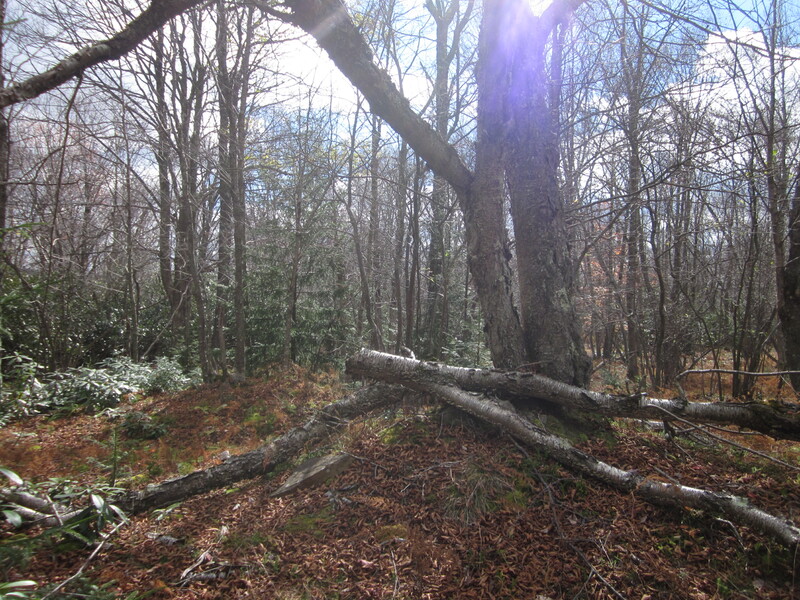 The orchard does back up against the woods, so some deer damage was not unexpected. Still, it was sad that they came out and nommed off all the little apples! That was several weeks ago. Maybe it’s a good thing that only one apple is left, because it does seem to be weighing down the tree! 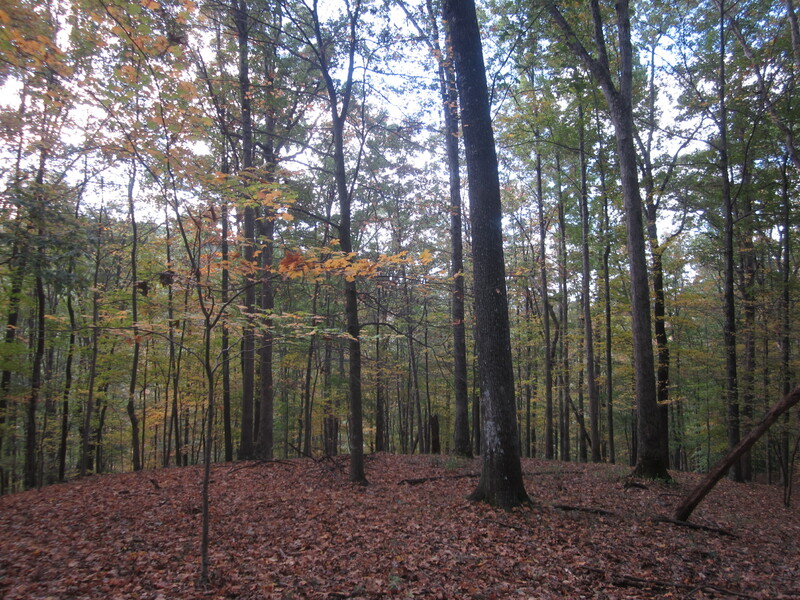 After that little incident, we tried to take precautions to protect the trees in the future. We can’t really afford to fence in the entire orchard right now (although that’s the long-term plan – not only will it protect the trees, it will also give Waylon a place to play), so we strung fishing line around the perimeter of the orchard, 5-7 strands ranging from about a foot off the ground to about 7′. 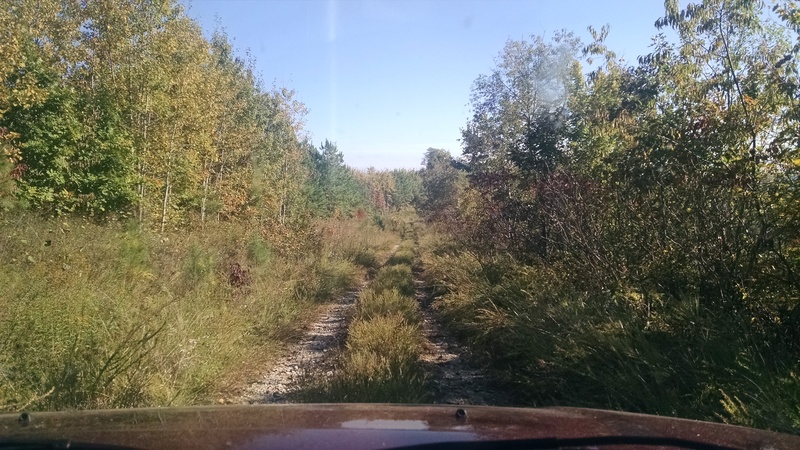 Supposedly, because the deer can’t see it, running into it really spooks them. I don’t know how true that is, but I do know that they haven’t molested our trees since. 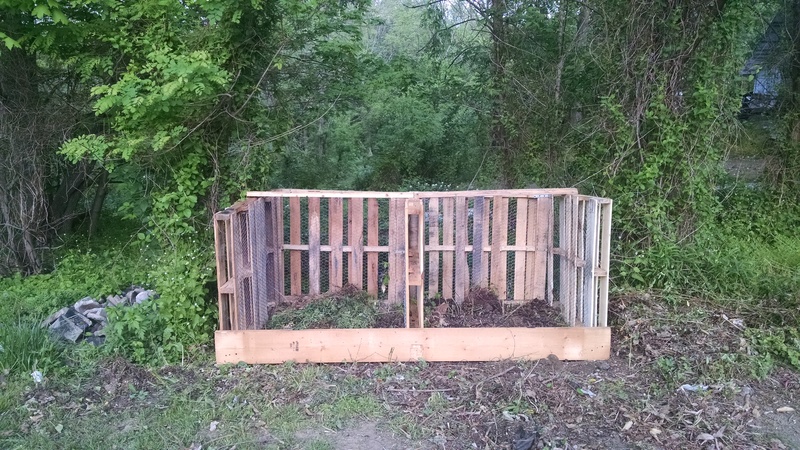 One must-have of every good homestead, as anyone knows, is a compost bin. Using some of those handy pallets my brother got at work, Tom built me a very sturdy and happy little compost bin. The divider in the middle is so you can add to one side, then the next year add to the second side while using the first side for dirt. What with all the digging out of random stuff and weeding and mowing and pruning going on, there is plenty of stuff to add to the bin! Both Tom and I have a strong desire to plant plenty of fruit, maybe because fruits are generally perennials, so planting them feels like you are planning not just for this summer, but for years to come. 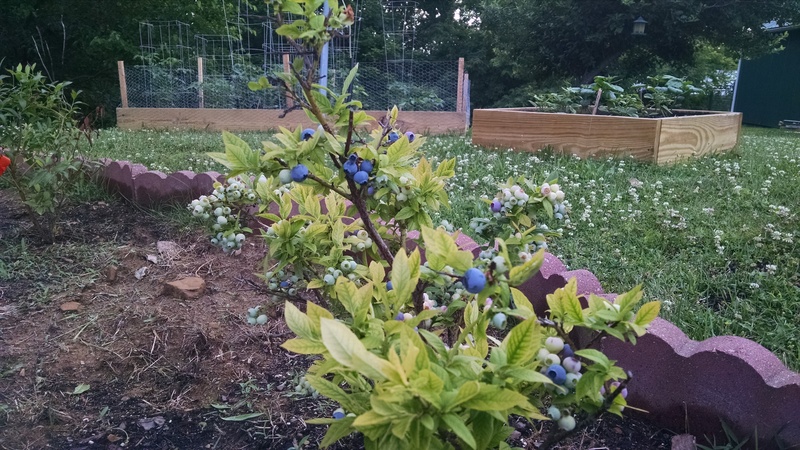 We got a good start with the orchard, and this year we also made progress with planting a blueberry patch. Next year, we’re hoping to plant raspberries and blackberries as well. Here he is, busily tilling away. Back in the day, before our time, where our flagpole is now used to be a swimming pool, so there is a round, flat area. 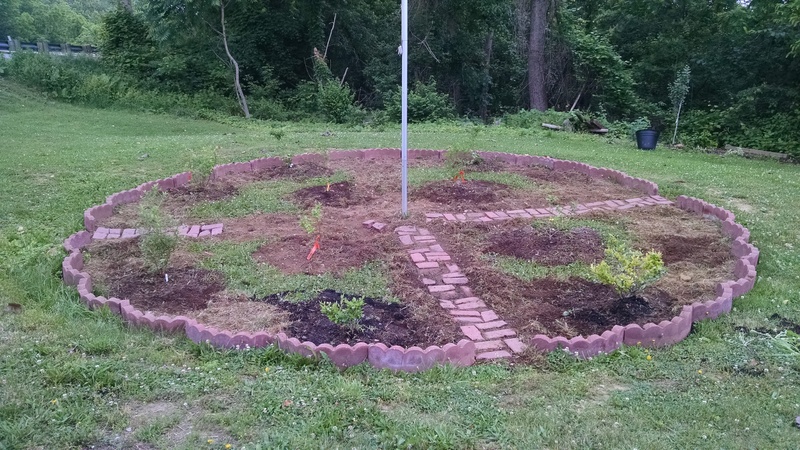 Inspired by that space, plus random pavers and other things lying about, Tom decided to make a compass blueberry garden, with the paths running N/S and E/W. 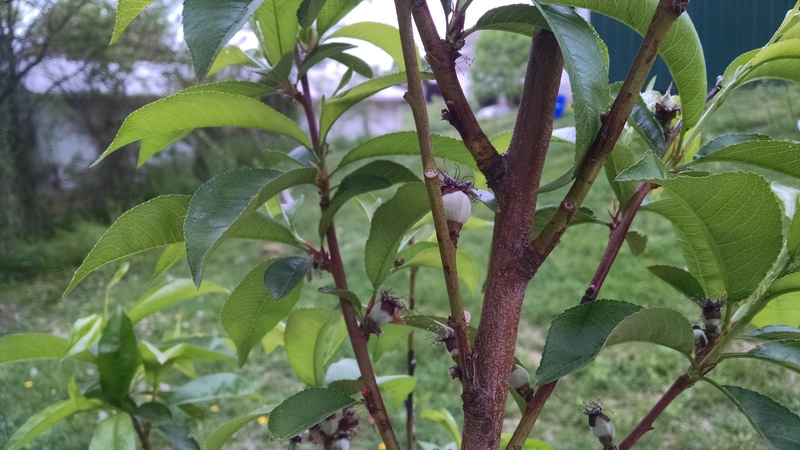 I already had two blueberry bushes, both of the Top Hat (a dwarf) variety (back before I knew about cross-pollination). We’ve picked up a few bushes on clearance at Tractor Supply, and the rest at a local greenhouse. I love blueberries, and we tried to get a variety of heights, types, and harvest times. We still have one empty spot, and one bush that doesn’t look like it’s going to make it, so we’ll still have a few slots to fill in next year. I’ve left the tags on until I have time to record which varieties are planted where. Still, we plant nine or ten bushes this year, so that’s a pretty good start! The Top Hat berries are on the small side and tend to be a bit more sour than some of the larger varieties. However, the flavor is still delicious – I rather like the tang! My two Top Hats both produced plenty of berries this spring, and several of the other bushes have done so as well. While we don’t really have enough to do much more than snack on them, it’s still always fun to actually get produce back! 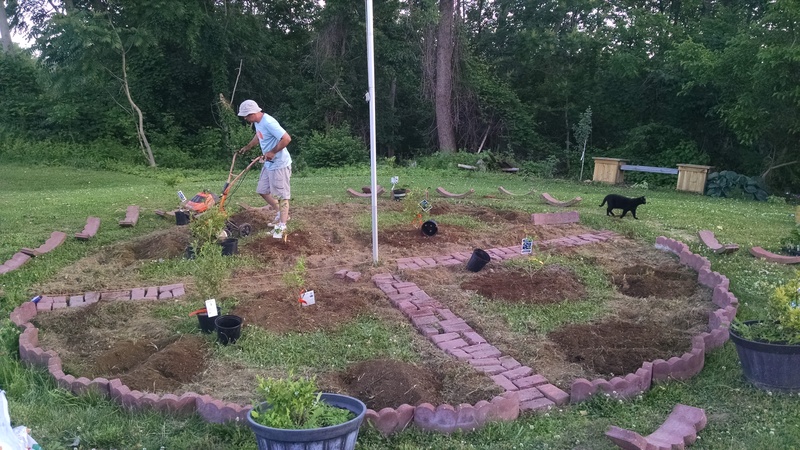 When Tom started digging out the water garden, he realized that we had a lot of dirt that needed to go somewhere, and it was actually pretty decent dirt, so we didn’t just want to dump it down over the hill. We started with dirt and then added the frame. Originally, we were going to wait until next year to plant some vegetables, and Tom wanted to plant them the traditional style – directly into the ground. 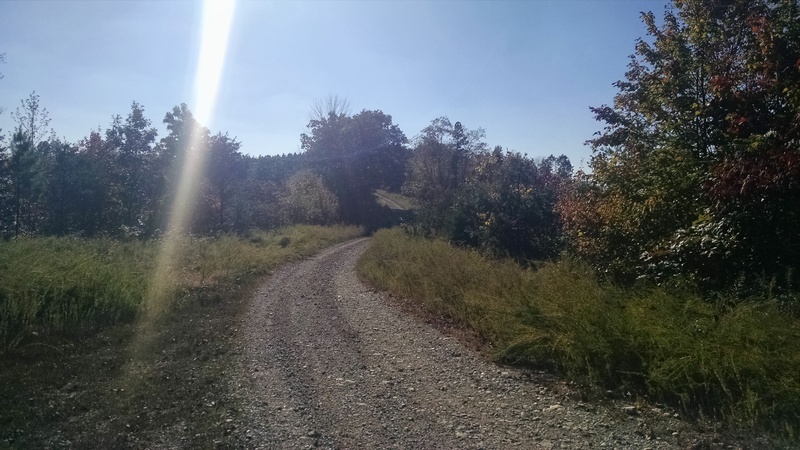 However, it appears that the entire pad in front of the barn, with the exception of where the ground was leveled for the pool (now the blueberry garden) was once gravel, so if you dig any deeper than the sod, you’re suddenly contending with about 6″ of gravel. It’s rather dreadful, and has made planting trees (like the aspen in the background of the blueberry garden picture) a real hassle. So, all that to say, we decided that we were going to have to go with raised beds. The fact that they are a bit more expensive out of the gate was an added incentive to wait until next year for veggies. Except… all that dirt we dug up for the water garden…!!! So then it seemed like it only made sense to go ahead and box in a raised bed… except then there wasn’t quite enough dirt so we had to get some… and then we got a flat of vegetables on a great sale for $10 except that was a LOT of vegetables and they didn’t all fit in that one bed… so we had to build a couple more… and… well, we’re raising vegetables this year! In the larger bed we have tomatoes and peppers. 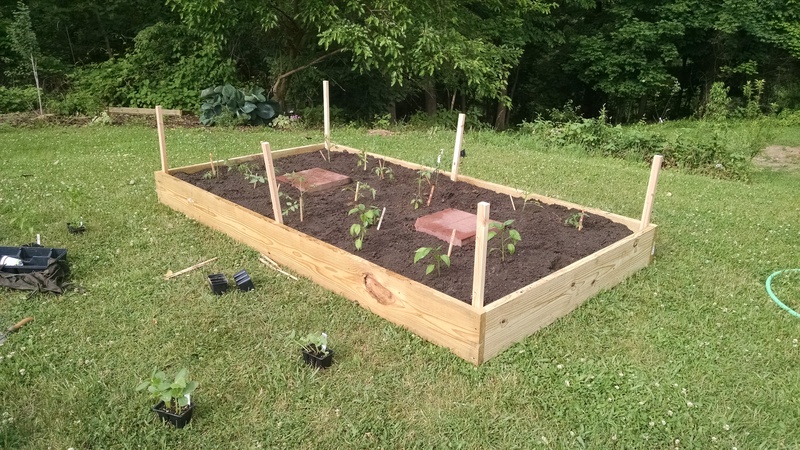 I’m quite bad at vegetables and not super awesome at spacing them, plus our bed ended up being just a *bit* too wide (we’re going with about 18″ narrower when we build a couple more next year. 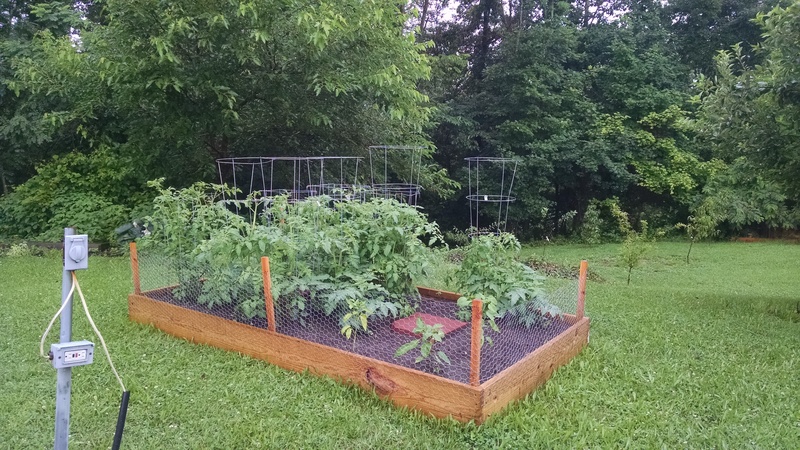 As of 27 June 2015 – about a month after planting!! We’ve been living in a rainforest the last couple of weeks – seriously, almost 10″ of rain in two weeks – so everything is growing like madness. We have lots of baby tomatoes and peppers, so hopefully we actually get some veggies!! This one has cucumbers and the other has green beans. Tom’s brother gave us a couple of boxes with a bench between them that he had built but didn’t need any more. We ended up taking the boxes and setting them up between where we park the cars and the blueberry garden. 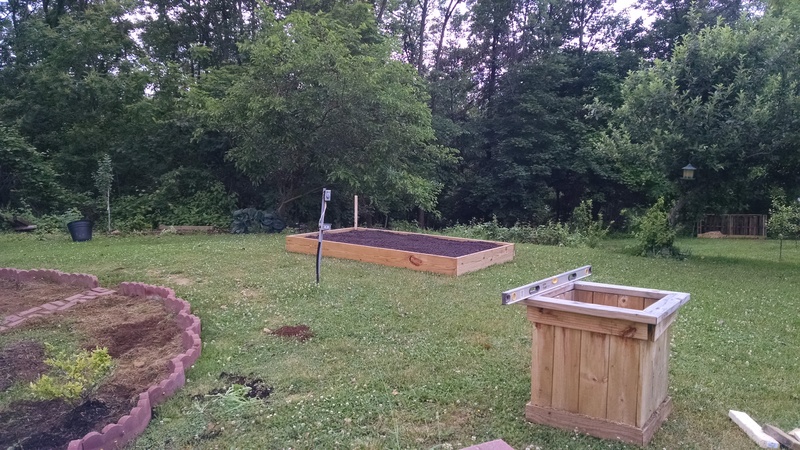 You can see an empty box in the picture with the brand-new raised bed, and here it is with some stuff in it. Like we did with the deeper containers in the side garden, we filled the bottom half or better with straw, and then dirt on top of that. Even if we grow the tallest cucumbers in the world, their roots probably aren’t going to be 3′ deep. 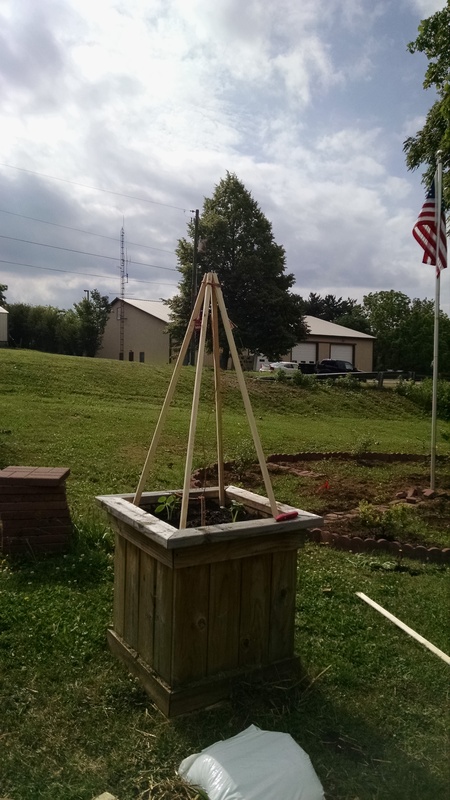 Tom built a teepee on top of each one and then ran some heavy wire around the outside so the plants can grow up. Pepper bed in the background behind the blueberries, then L to R – cucumbers, bush veggies, and tomatoes/peppers. We also have some bush beans and bush cucumbers in a smaller raised bed, and another small bed of peppers (and yes, ALL OF THOSE VEGGIES were in ONE $10 flat!). They are also flourishing, thanks to so much rain. 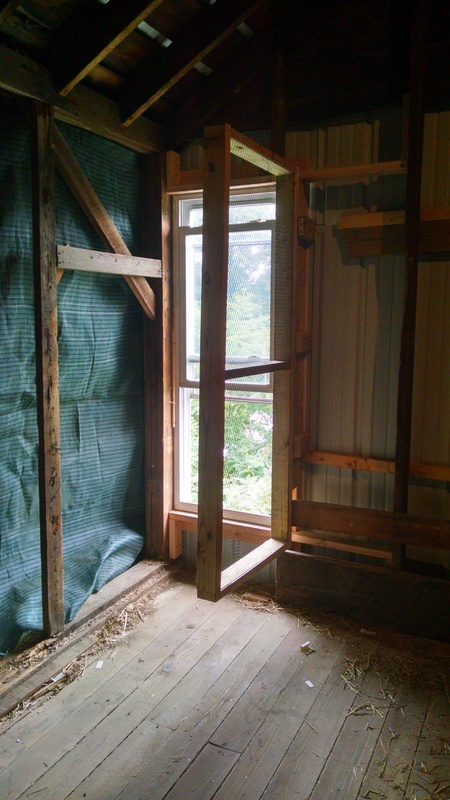 One other random project we’ve been working on is getting the upstairs of the barn back into usable space. I don’t know if any of you have this tendency, but we seem to get an area cleaned and organized, then move onto another project, and then the original area becomes messy and confused, and then we go back and add more shelves or improvements to reclean and reorganize, and it just keeps cycling around. For instance, the lower room, which looked beautiful this winter, is an absolute disaster right now – and Tom is in the process of building more shelves, so it will be the next big thing organized (again). 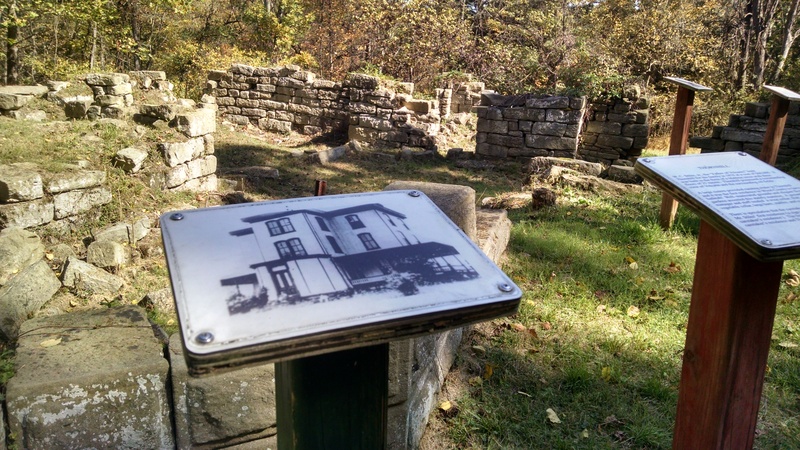 The wooden frame has small-gauge chicken wire stretched over it. The frame swings open so we can open the windows, or closed so it is protecting the windows from flying basketballs! 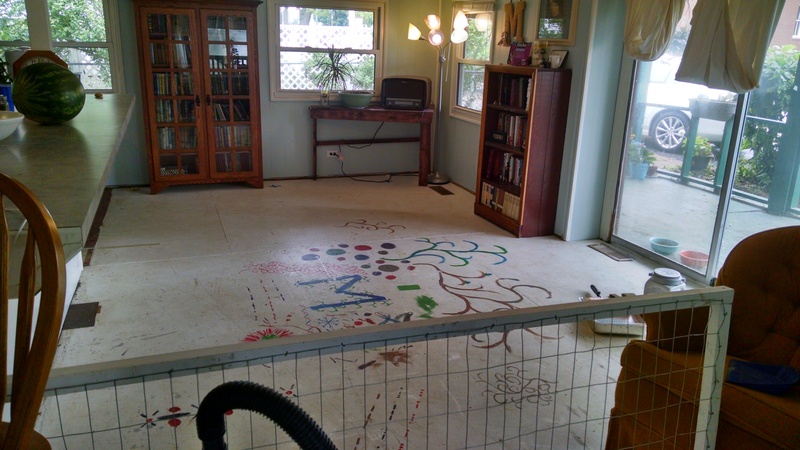 Anyway, the upstairs of the barn was pretty messy with various projects going on. Tom worked hard cleaning it up over the weekend, and also building some protective cages around our brand-new windows! 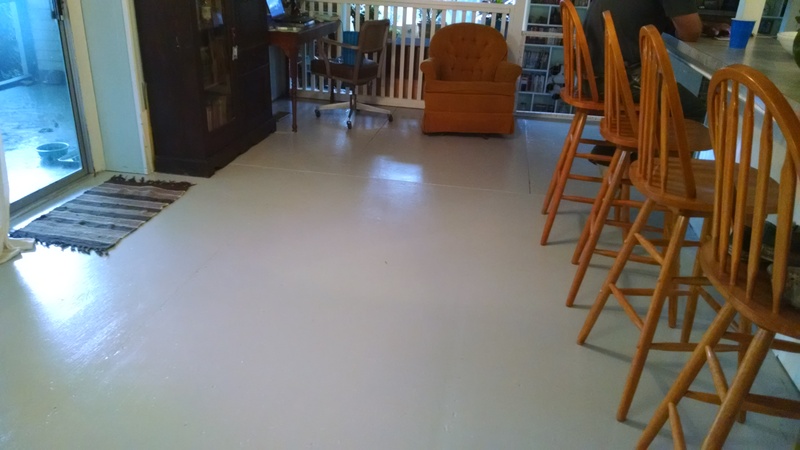 I didn’t get a picture of the upstairs as a hole, but the space is back to being usable for playing basketball, pool, or darts again, which is pretty exciting. The windows help a lot with ventilation. While it will still be too hot to play up there on really hot days, it should be perfect up there on more mild days. In the future, we’re still hoping to install a couple of windows on the other side of the barn, as well as an exhaust fan. Three coneflowers, two daisies, and one blanket flower… and I only actually bought one plant!! One thing I’ve really been trying to do this spring is plant a lot of perennials. 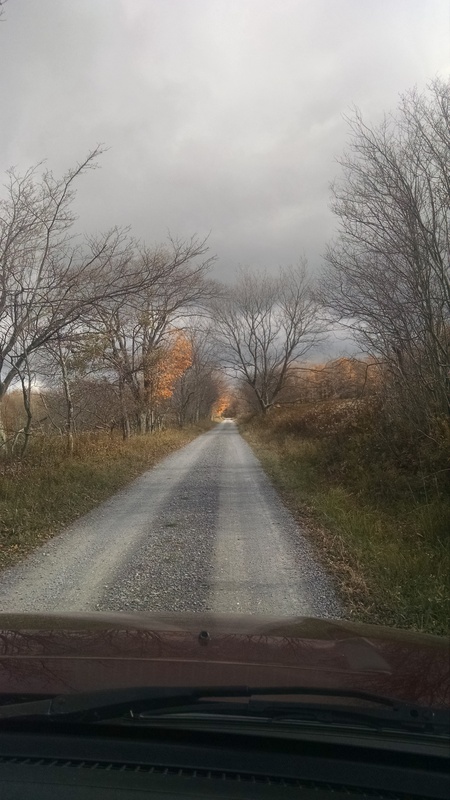 I’m sincerely hoping that next spring will involve a lot less expense and labor. I especially love coneflowers and daisies of all types. They’re low maintenance, have long bloom seasons, and look lovely as cut flowers as well. The fun thing about lots of different perennials is that you can get them for free from people who need to divide theirs. Mom gave me a bunch of coneflowers and daisies (as well as some bee balm, lemon balm, and chives), and our neighbor gave me some coneflowers as well. Everything that I’ve transplanted is taking off, and I am super happy that coneflowers are starting to bloom (the daisies are budding up now, too!). So that about brings you up to date on all the craziness around the McCafferty homestead! As you can see, it has been a seriously busy spring. 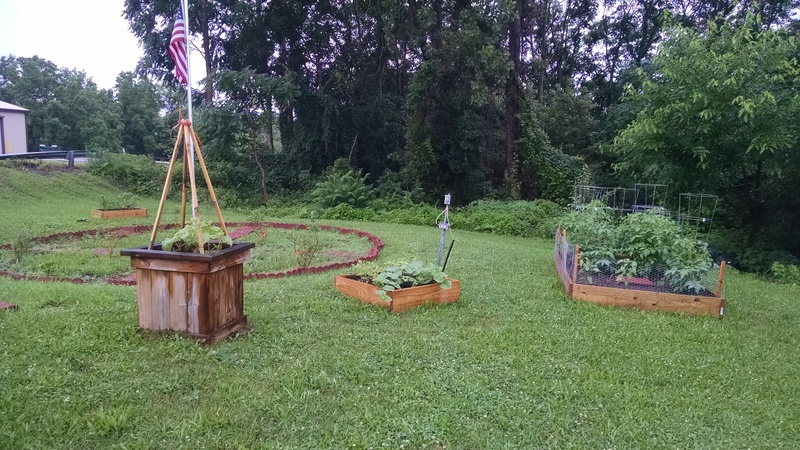 This morning (June 29) is a perfect day to be alive – cool, no humidity, moderately overcast, and the dirt is just right for pulling weeds, which is what I’ve been doing in between writing this post. Life, my friends, is good. Stay in touch. So for some reason, as soon as bought this place, I immediately began yearning for a small water garden in the side garden area. There is an overhang that runs the full length of the house on the north (side garden) side, creating a sort of very long, skinny patio. It just felt like it would be perfect to have a bench tucked under the overhang where you could sit and look out at a little fountain with maybe some flowers and fish. 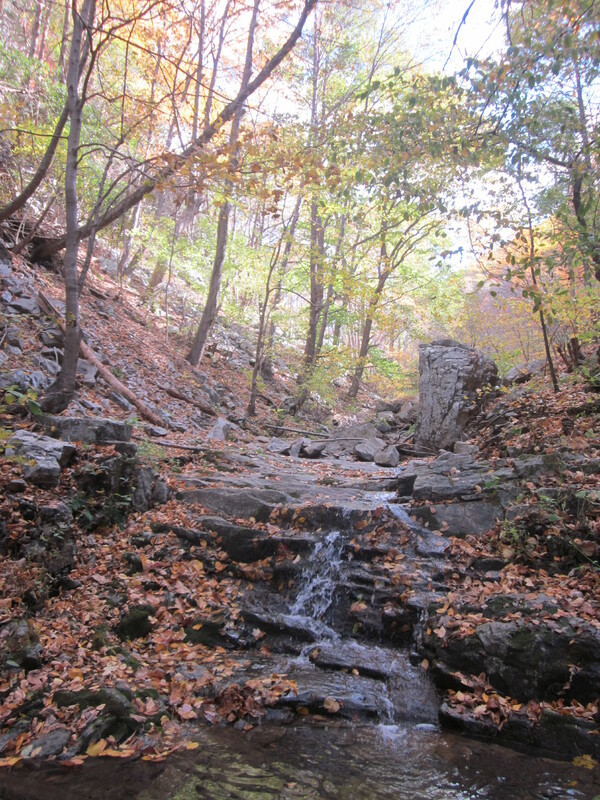 I really, really love running water, so that probably has something to do with it. Conveniently, I married someone who is always trying to make my dreams a reality (and, also conveniently, has a lot of the same dreams :-D). Like most of the projects we’ve been working on around here, this was another “oh we should do this next year” project that somehow is done already…??? This picture is from last year after our first major tearing-up of the side garden. You can see the overhang I’m talking about on the right side, along the house. 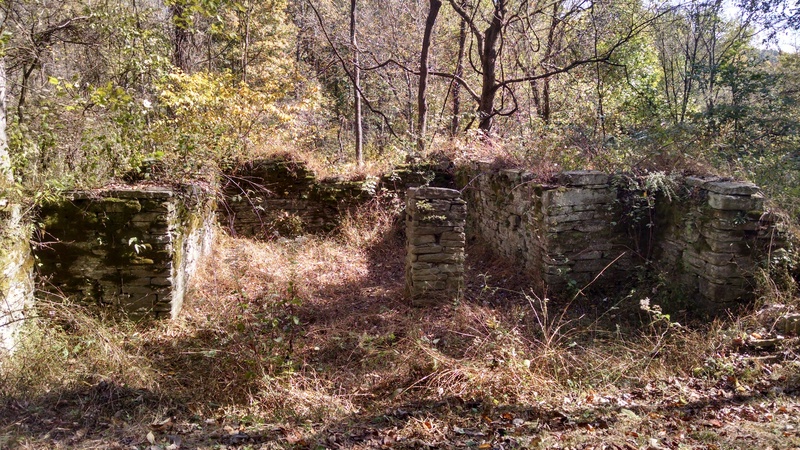 In the background, you can see a small brown pump – that’s where that cistern is that I was talking about yesterday. We’ve kept the tall hibiscus bushes along the left, but dug up some of the smaller shrubs, including that huge hosta in the foreground. 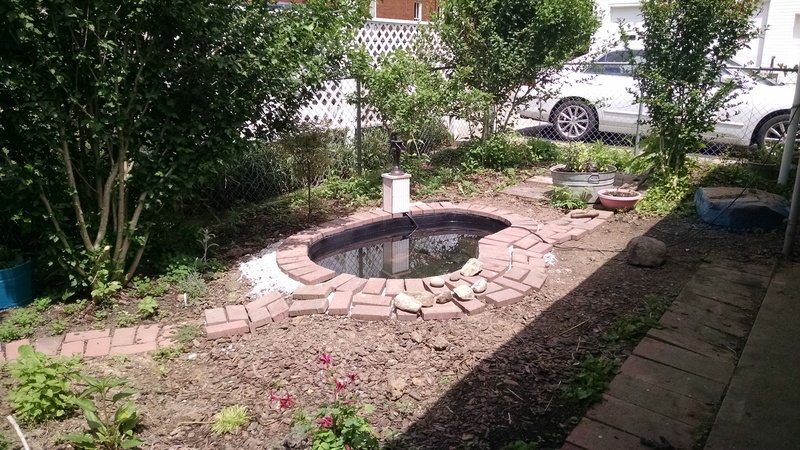 The little pond is now in the ground in front of the cistern. 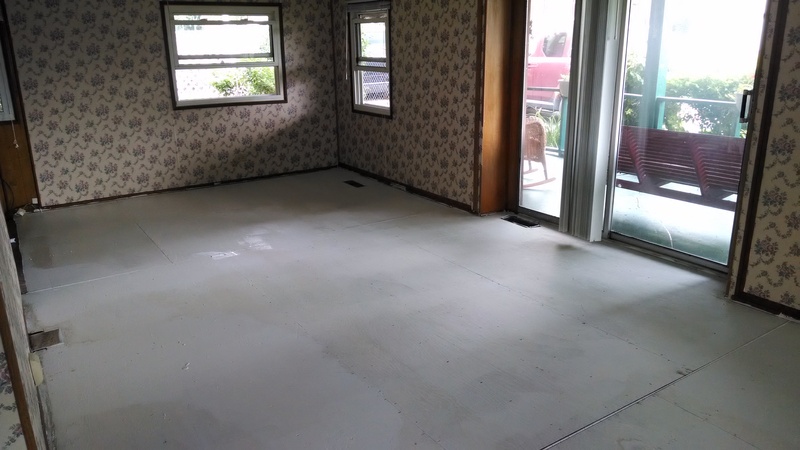 Like most of our projects, we had two major limiting factors: space and price. We actually had a decently large area we could work within, and then we spent some time research various ways to line the pond. 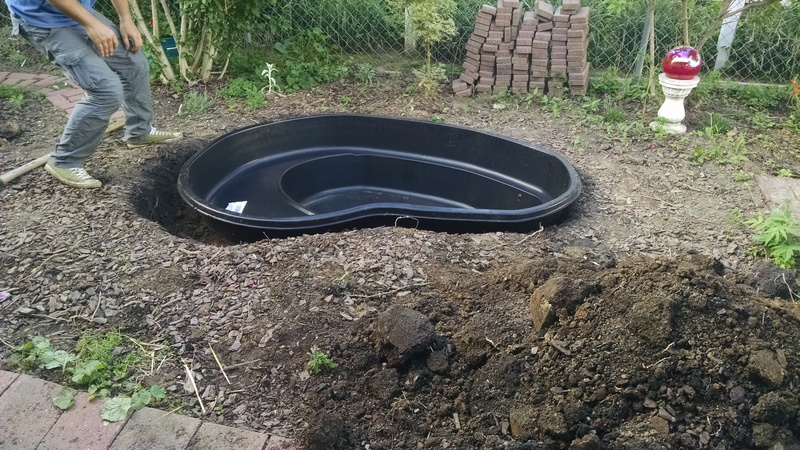 In the end, even though we were tempted to try lining our own custom-shaped pond with plastic liner, we decided to go the pre-formed route for the sake of simplicity. This also helped limit the options of size and shape. 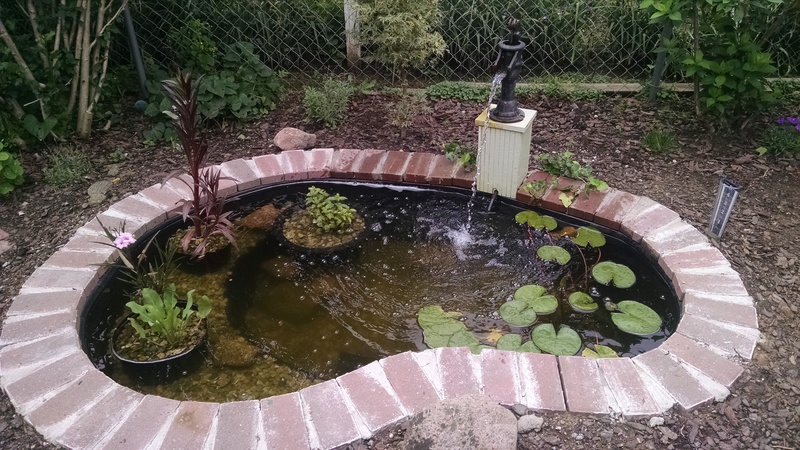 The pond we chose is about 6’x4′. It’s a little smaller than we wanted, but the next step up was HUGE and the shape seemed really weird, so decided to go smaller. Maybe someday, if we get crazy, we’ll build an upper level pond that pours into the lower…?? The fact that Tom did most of the digging made it a pretty easy job for me. Once we’d chosen and purchased our pond, it was time to dig the hole. Luckily, the whole side garden area is actually pretty soft dirt because we’ve been digging shrubbery out of there for a year. So while it was definitely a lot of work, it could have been a lot worse. 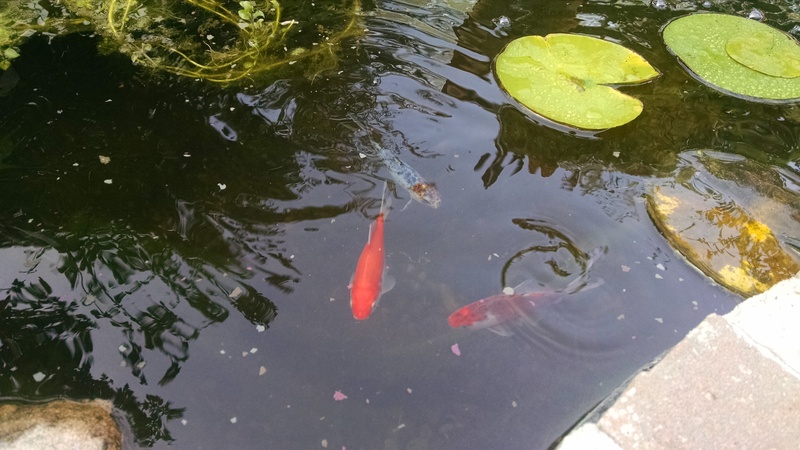 As you can see, the pond has a shallower shelf and then then a deeper main pond. 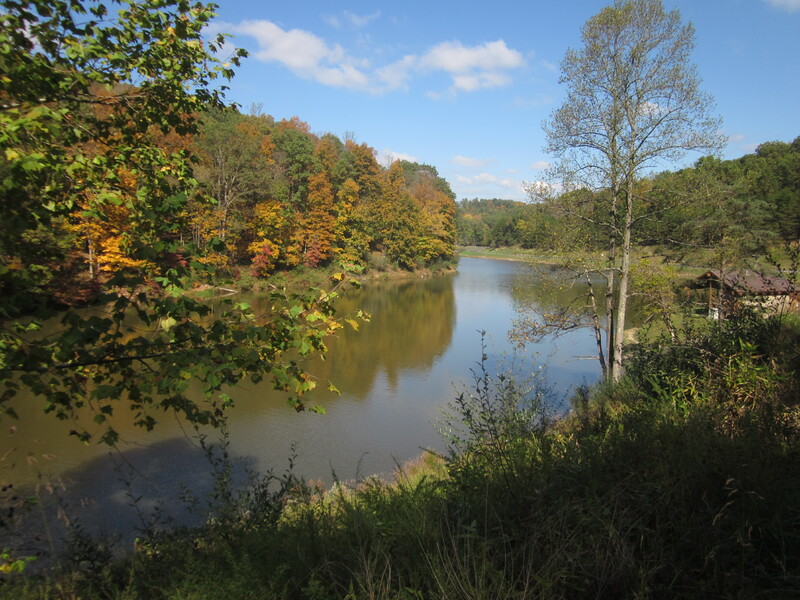 In our zone, water needs to be at least 3′ for fish to survive overwinter. 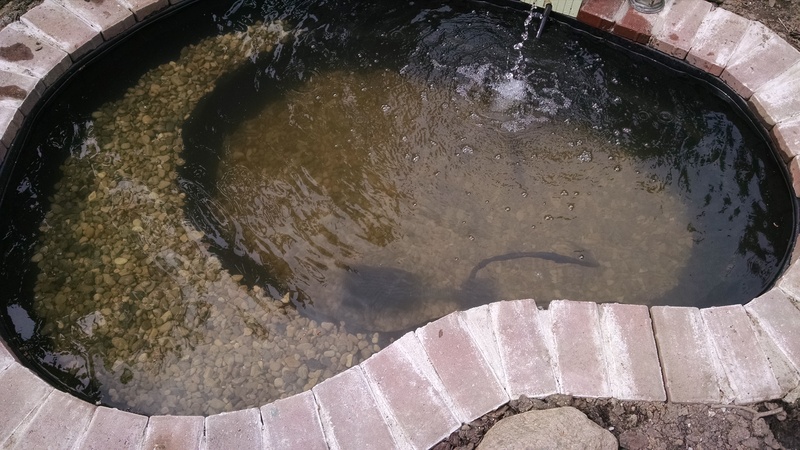 We don’t have that depth with this pond, so if we decide to get fish, we’ll have to bring them in for the winter. Tom is always trying to jump out of my pictures. As the hole got deeper, Tom began setting the pond in to see if it was close yet. 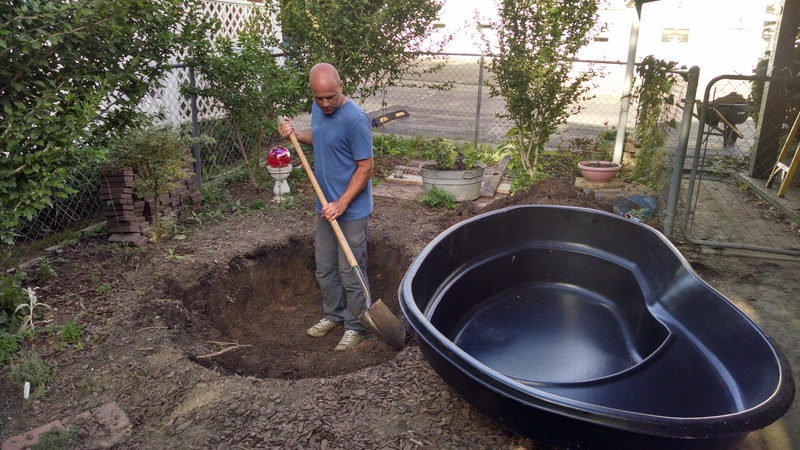 He dug the whole slightly deeper than it needed to be, as the easiest way to level a preformed pond is by putting sand/small gravel in the bottom of the hole. Still experimenting with pavers at this point. 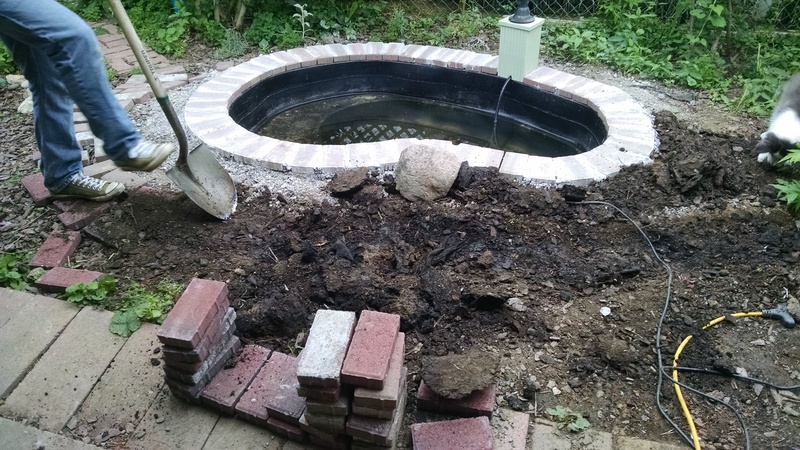 After leveling the pond, which also involved slowly filling it to give it the appropriate weight, Tom backfilled dirt and gravel along the sides of the pond. We had some extra pavers because the old owners of this house randomly used them everywhere, so Tom decided to use those around the edges of the pond. He wasn’t sure exactly how to best stack them, so we tried a couple different methods. We also weren’t sure, at this point, what kind of fountain/waterfall we wanted, or how to make it work. We also knew that we wanted to tie-in the little brick walkways from the other side of the garden to make it all flow together. So many decisions!! 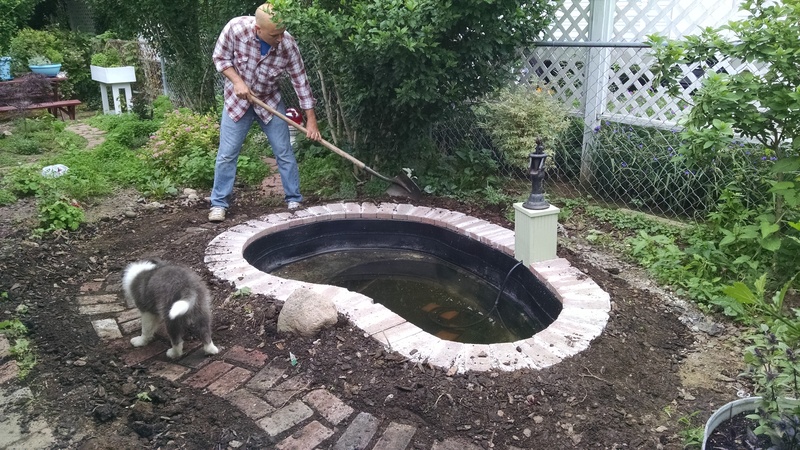 In the end, Tom decided to go with a single layer of the pavers with the short ends against the edge of the pond. He used some of the fine gravel as a base under the pavers to help level them. Originally, the pump was in it’s own little barrel water garden, but Tom was confident that he could make it work for our pond instead. At this point, nothing is mortared yet. Still making decisions!! He built a little pumphouse box for the pump, and, after I painted it, mortared it into the paver wall along with the bricks. Even after we decided how we wanted the bricks along the edge of the pond, we still had to figure out how to make the path flow, too. Tom is, of course, displeased with his mortaring job, but I think it is quite excellent. Also pictured: Waylon, assisting with the digging. Tom mortared in the bricks and the pump, and then worked on digging out the path. At this point, we were working on draining the pond so we could clean it. While we still have to do some work on the path, as it doesn’t drain quite right, I really like the way it follows the curve of the pond. I’m hoping to plant something soft and floppy between the path and the pond. 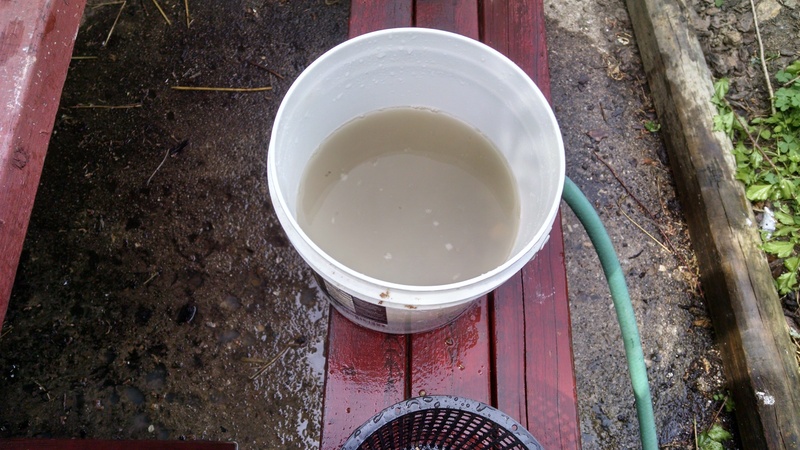 At this point, we drained the pond, wiped the inside down completely, and then refilled it. 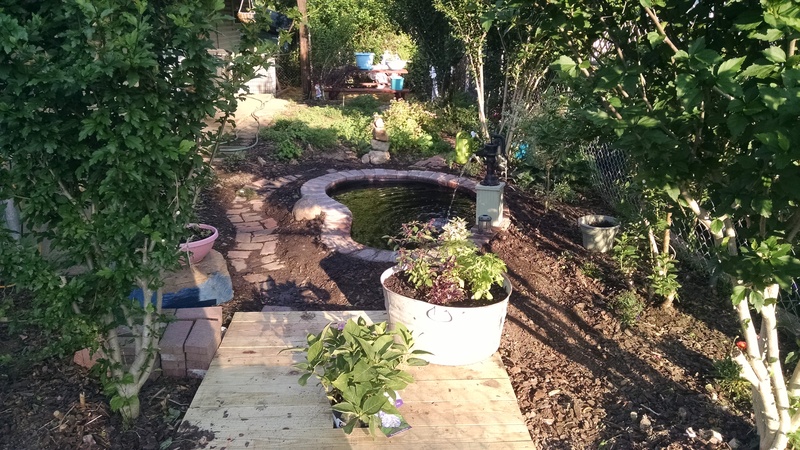 The whole area was starting to look pretty good, as Tom had also rebuilt the cistern deck. 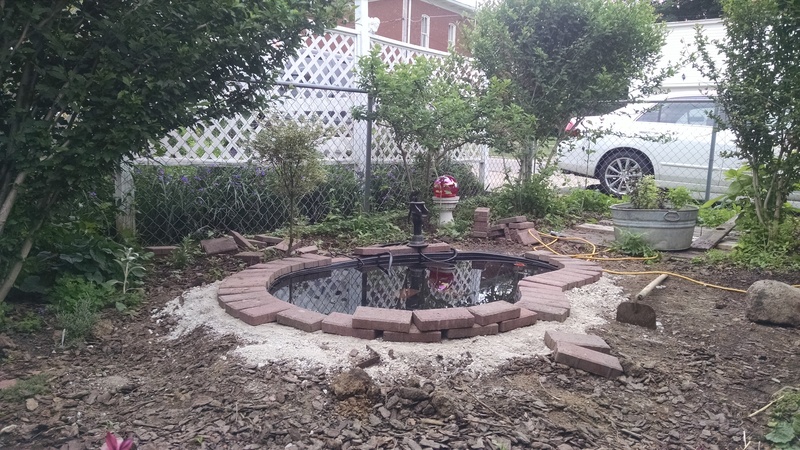 We really wanted to put something in the bottom of the pond instead of just the plain black, and thought that gravel would look really nice. River rock was about $3.50/bag and we only needed around 4 bags, so it wasn’t too expensive. However, the gravel was too dirty to dump directly into the pond. So I got the lovely job of, yes, washing rocks. 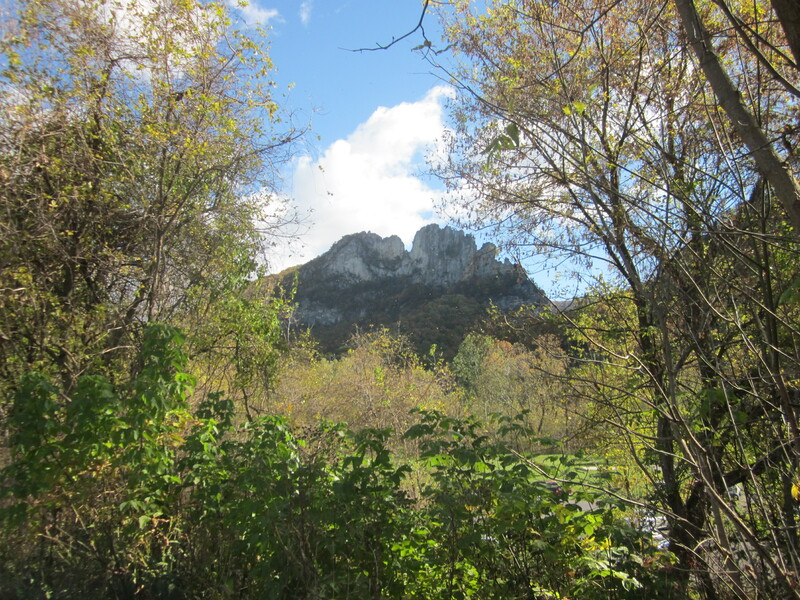 The river rock was pretty shades of browns and greys, but somewhat dulled by dirt. We had a couple of plastic baskets that were ideal for this project. First, we would fill the baskets with rocks. 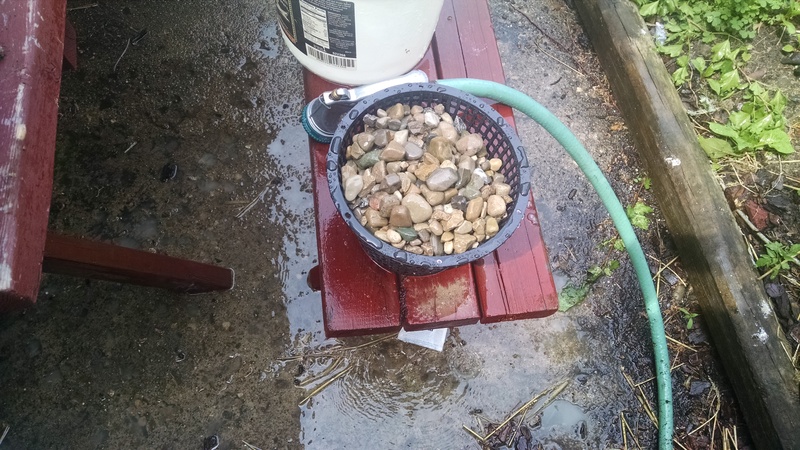 Then I would use the hose to spray the rocks until the water running out of the basket was moderately clear. Washing rocks meant our pond didn’t end up this color. Next, I would pour the rocks into a bucket, cover the rocks with water, and swoosh them around. 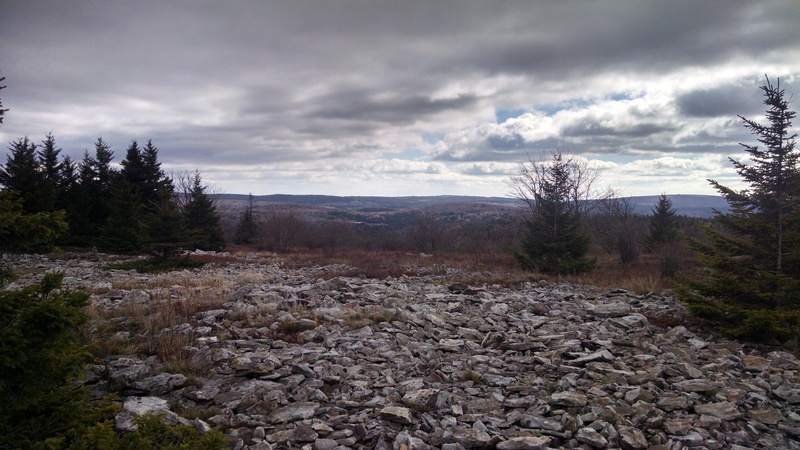 As you can see, the rocks were still pretty dirty at this point in the process. Although not super obvious in this picture, the washing really brightened the colors. 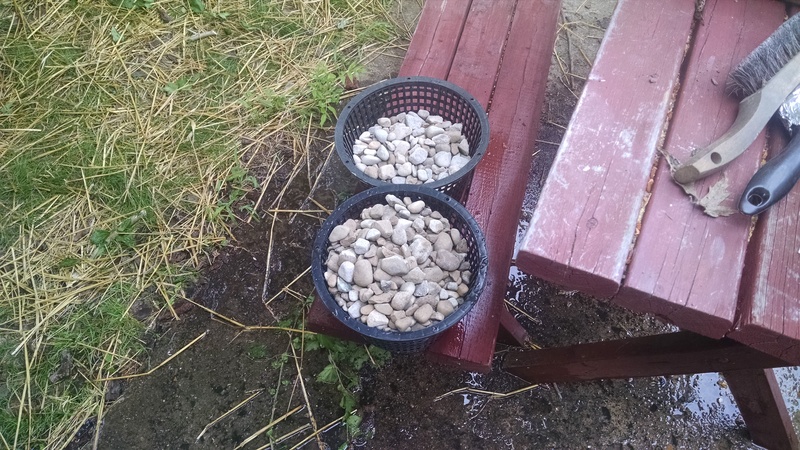 Then I would pour about half the rocks back into the basket and rinse, add the rest of the rocks and rinse, and then return them to the bucket for another slooshing session. Finally, in the basket for a last rinse, and then in the pond! 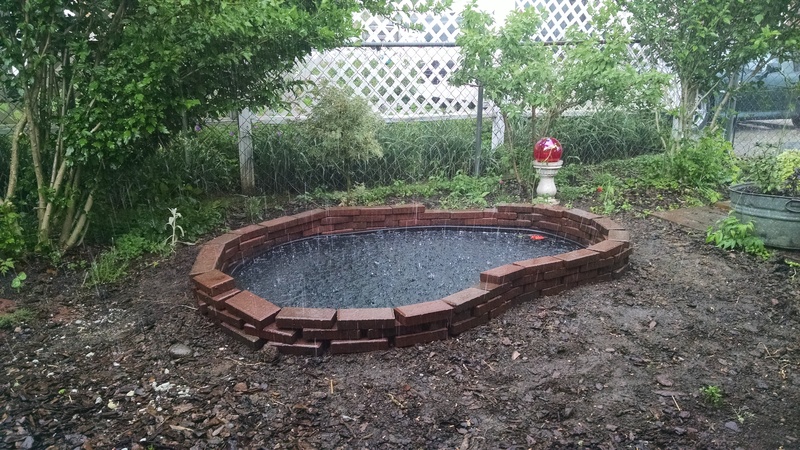 Although it took a lot of water and a lot of steps, the end result was worth it, especially since the rocks barely clouded our pond at all. We really like having some color and texture at the bottom of the pond, especially at a low price-point! Of course, Waylon thinks this whole project was just to make him an awesome water dish. Now we were ready to start thinking about some plants!! The tall, red plant is a Cardinal Flower. 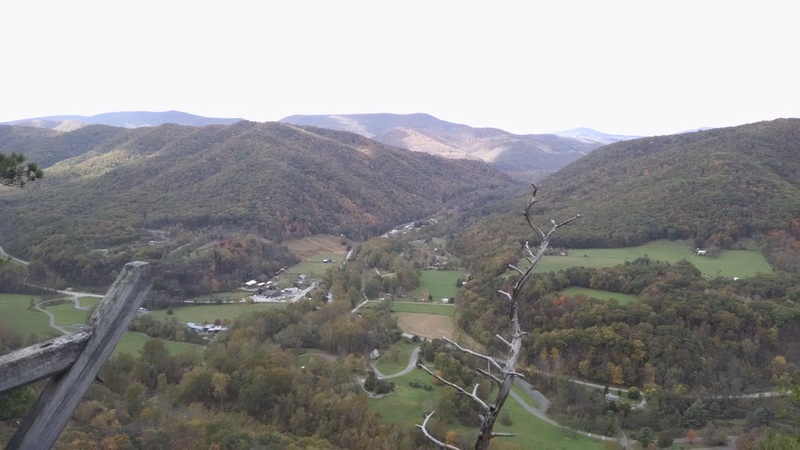 It may be able to overwinter here, but we are on the edge of its survival zone. 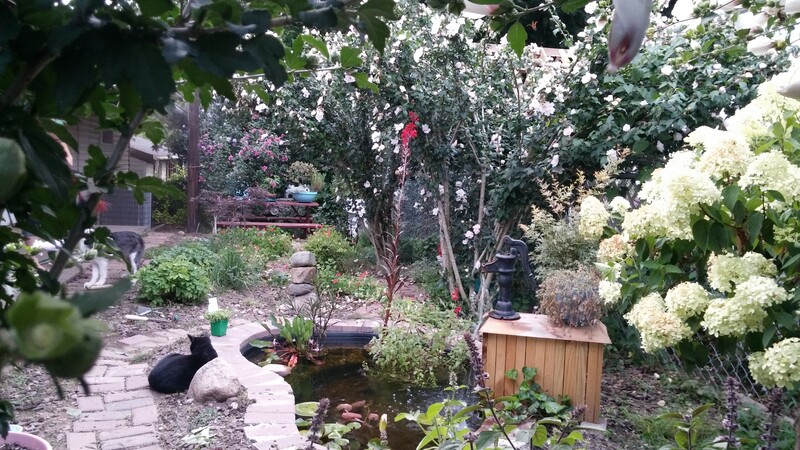 In the front left, the plants with the pink flowers is a Pink Bells. It’s only hardy to zone 8, so it won’t overwinter here. However, it blooms basically every day (the blossoms all fall off in the evening??) and is super pretty and happy. The Pink Bells are sharing a pot with Bear Root. This plant will stay a little shorter and should have white flowers. 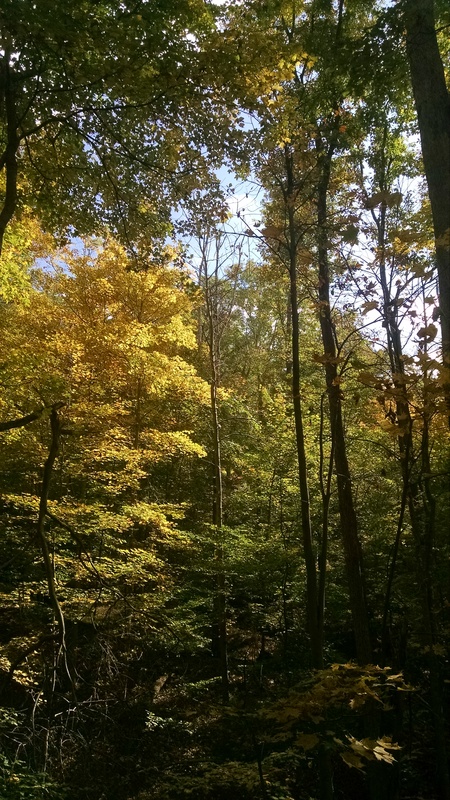 It’s also hardy to zone 3, so it may actually make it overwinter. In the back is some water mint, which will have purple flowers and is already putting out some runners – like ground mint, it will spread if given a chance!! 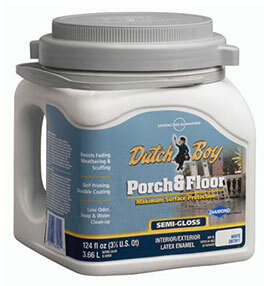 It’s zone 6, so is another iffy plant for winter survival – we’re technically zone 6 here, but right on the line of 5 – about every 4-5 winters we have a zone 5 winter, basically. Finally, on the right is our one indulgence – a water lily. 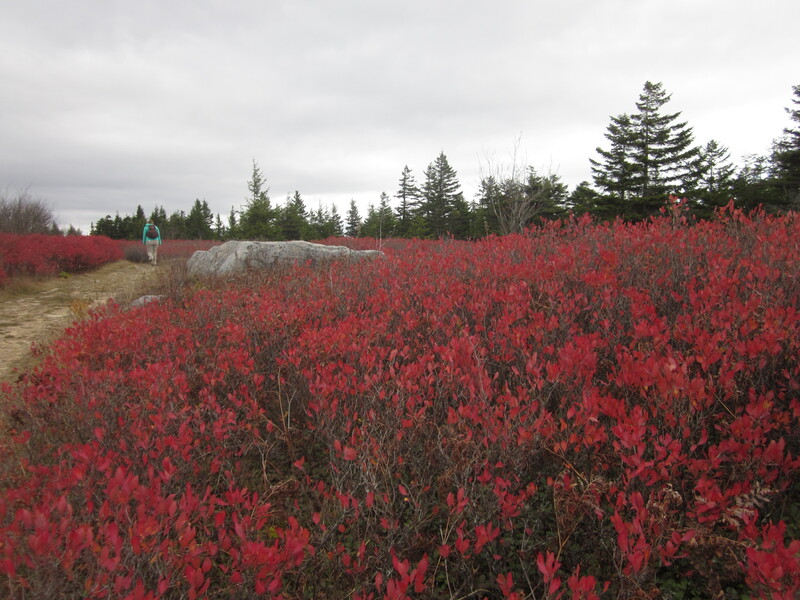 While somewhat expensive, it should overwinter, and it’s been blooming – so pretty!! 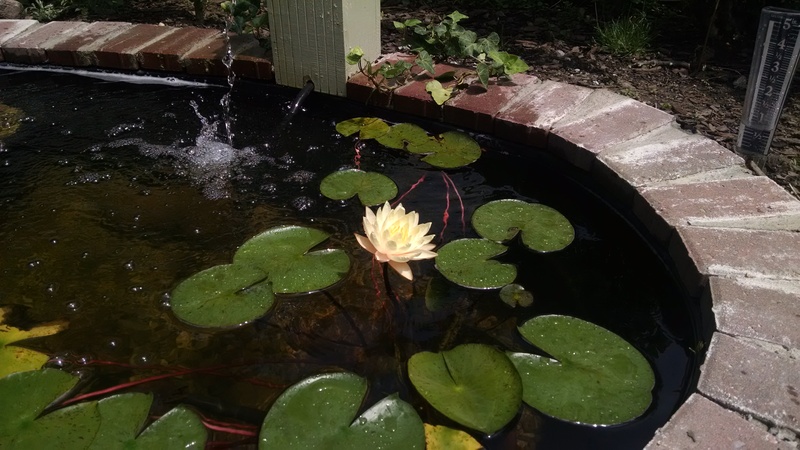 Our neighbors have a small pond like ours and say that their lily has survived about ten years, so I’m cautiously optimistic that it will make it over! Blooming plants make me feel like I’m not a total failure at gardening! For some reason, having the water lily bloom just makes my day. I’m not very good at taking pictures of flowers, so you’ll just have to trust me that yellow-white-pink is just beautiful. Overall, the water garden was a pretty big project, but we are super pleased with the results. However, since planting the plants, we have noticed our water getting dingier/greener, so we are going to go ahead an invest in an algae filter. But that’s another project for another day – I’ll let you know how it goes! !